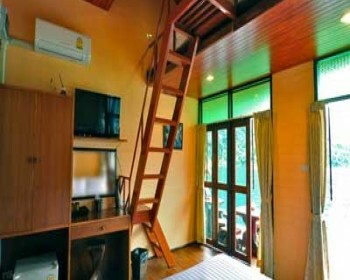 Khao Sok Lake Luxury Floating Villas are for the traveller who wants to enjoy the best Khao Sok lake has to offer. 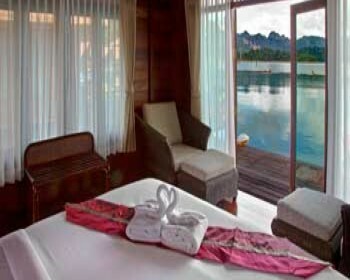 There are 2 Luxury floating Villas on Khao Sok Lake which meet the “Luxury Standard”. They are the finest lodging available on the lake. Panvaree and 500 Rai feature hardwood interiors, private bathrooms, and even air conditioning for an additional fee. Both Villas feature private diving platforms, cook to order restaurants, and an ambience of privacy that the other raft houses lack. They come with higher price to be certain, but well worth it for the discerning traveller. DISCLAIMER: All bookings are subject to availability. Conditions on Khao Sok Lake vary from week to week. Based on a commitment to quality, Khao Sok Lake does not guarantee a specific raft house, but we will always place you in one of equal or greater quality. Featuring Hot showers, Satelite TV, and Air conditioning in both family villas, and honeymoon suites. The raft house itself features fine carved wood detail and a beautiful restaurant with cooked-to-order meals. 500 Rai Floating Bungalows is a privately owned raft house who prides themselves on offering a premium experience in a remote location.